Hearst, the media, information and services company, today announced the September 27 launch of a new multimedia installation that will promote many of its over 350 businesses and run along the base of its Norman Foster-designed tower in Manhattan. 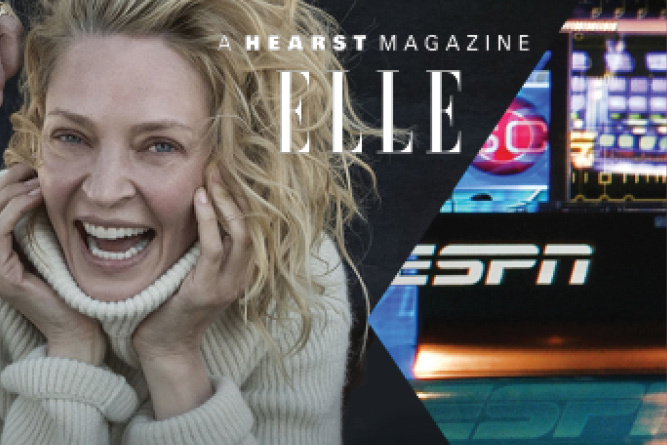 Dubbed HearstLive, the installation will display high-definition imagery and content from Hearst’s English-language publications--including magazines such as Cosmopolitan, Elle, Harper’s Bazaar, and Car and Driver, and newspapers such as the Houston Chronicle and San Francisco Chronicle. It will also feature content from broadcast and digital properties that it partially owns, such as A & E Networks, ESPN, Vice, BuzzFeed and AwesomenessTV, and from services such as Fitch Group and Hearst Health. On the Eighth Avenue side of the tower, it will be almost 55 feet long and 9.5 feet tall, while on the 57th Street side of the tower, it will be 52 feet long and almost 9 feet tall; content will be the same on both sides. According to Paul Luthringer, Hearst’s vice president of marketing communications, content on display will be curated by three news producers—including former staffers of CBS and MSNBC—who will select stories provided by Hearst’s many businesses, as well as appropriate breaking news, to display, all illustrated with photos or video clips. More than one hundred stories will run each week, none for longer than 24 hours. For example, he said content from ESPN’s "Sports Center" program could run in the morning, when the program is broadcast, while content from Esquire and A & E could, respectively, feature events such as Fashion Week and the Emmy awards presentation. Content also will cover holidays and other events taking place in New York, such as the auto show and marathon. Content appearing on the installation generally will only briefly illustrate or summarize features and news; passersby will be directed to use their smartphone to go to a website, HearstLive.com, that will contain slideshows and videos that will flesh out content. In addition, Hearst will stream Twitter and Instagram trending information on its brands at the entrance to its tower at the southwest corner of Eighth Avenue and 57th Street, and also at BrandCentral@HearstLive. Luthringer—who declined to reveal what Hearst, which is privately held, was investing in the initiative—said its goal is to educate people on the street about "the depth and breadth of what we do, what’s going on inside the tower, what we produce. It’s purely an editorial marketing platform. . .to tell people who we are, that Hearst is not just a publishing company, that we’re now in so many different businesses." According to Hearst, over a quarter of a million people pass the intersection of 57th Street and Eighth Avenue each week, while the Columbus Avenue subway stop there—which also serves the Time Warner Center and Jazz at Lincoln Center—is New York’s seventh busiest transit hub. Tourists on sightseeing buses will also be exposed to the display, Luthringer said. Hearst has been developing the installation—created to accommodate Foster’s architectural plan--for the past year, working with New York-based creative digital agency, Code and Theory, and with Activate the Space, which designed and integrated the installation’s LED technology. Luthringer said he was "not aware of anything similar" anywhere else in the world. The tower, which rises almost 600 feet above its landmarked, six-story base, opened in October 2006. Is this Skittles statement the best corporate response to the Trump campaign yet?